VISIONS OF THE NORTH: A "Navigable" Northwest Passage? Recently, the question of in how Dr. John Rae's charting of the strait that bears his name contributed to the tracing of a Northwest Passage. There can, I hope, be no question that Rae was one of the most skilled and capable Arctic explorers and surveyors, and that his establishing King William as an island was a discovery of great geographical significance. There are those, however, who wish to credit Rae, at the expense of Franklin, as the sole discoverer of the passage, and for them, a key part of the claim is that the Rae Strait route would have been navigable by Franklin's vessels had he tried this route. And yet, it's also widely known that, although Roald Amundsen managed this route with his tiny Gjøa, he encountered shoals which obliged him to jettison a considerable amount deck cargo in order to avoid running aground. Rae Strait is 14 miles wide. I have sailed through it half a dozen times in ships that are far larger -- longer, heavier, and with much deeper drafts -- than the Erebus and Terror. I did it again last month. Google the Clipper Adventurer and compare. Big ships go through Rae Strait all the time, even in the dark. Amundsen was sailing very near the coast of KWI, that is all. A bit farther out, no problem whatsoever. For the record, the Clipper Adventurer, a purpose-built vessel for adventure tourism, has a draught of 4.72 meters (15.5 feet); HMS Terror had a draught of 4.47 m (14 feet 8 inches); according to Amundsen's journal, the Gjøa, fully loaded, drew just over 10 feet. A recognized reference on the subject, The Northwest Passage: Arctic Straits, by Donat Pharand and Leonard H. Legault, puts it succinctly: "Reconnaissance soundings show an uneven bottom with depths varying from 9 to 77 meters and an extensive shoal area in mid-channel of 5.5 to 18 meters. The Rae Strait would hardly seem suitable for deep draft navigation." It's possible of course that a sailing vessel of Franklin's kind might have, with very good fortune, have made it through -- but then there would be the far worse problem of Simpson Strait, which is filled with shoals and hazards. The modern vessel "Hanseatic" (draft 4.8m) spent three weeks aground there in 1996, and Pharand and Legault class it as "obviously suitable for small ships only." So how practicable is this route -- which must of necessity include both Rae Strait and Simpson Strait? To get a definitive answer to this question, I turned to Captain Patrick R.M. Toomey, one of the most experienced modern navigators and ice-pilots in these waters; he has made more than 30 voyages to the Canadian Arctic, including 13 complete transits of the Northwest Passage (the most recent just two weeks ago), and has commanded or piloted all manner of vessels ranging from Canadian Coast Guard icebreakers to enormous Russian vessels such as “Kapitan Khlebnikov. "Although Toomey shares with me and many others a profound admiration for Sir John Franklin's mettle, he understands well the limits of the vessels of those days, and feels as I do that they would never have been able to manage this route. The “Clipper Adventurer” has been through the straits to the east of King William Island, as have other small ships of less than 5 metres draft such as “Hanseatic," and Rae Strait is not the major problem on this route. Further north, the James Ross Strait, and to the southwest the Simpson Strait are far more dangerous, as the “Hanseatic” knows only too well, having spent almost three weeks aground in the Simpson Strait in 1996. If Ken McGoogan considers “Clipper Adventurer” to be a “big ship”, he should try “The World” at 6.7 metres draft, and 196 metres length, or the Russian icebreakers “Kapitan Khlebnikov”, “Kapitan Dranitsyn” and “Admiral Makarov” (all of which I have piloted) at 8 metres draft, which could, technically and theoretically, pass all three of the straits mentioned above, but would be very foolhardy to try. As for the claim that John Rae was the first to discover a navigable Northwest Passage in 1854, to give him credit he did discover one of the minor channels which form the route, which Franklin might have discovered himself during his three overland and small-boat expeditions from 1819-1823, if he had had more time and better luck. I would suggest that Franklin suspected there might be several routes to the north from Queen Maud Gulf – the south shore of which he had mapped - but that he was more interested in the wider channel to the west of King William Island, due north of his explorations along the coast east of Coppermine River. With two clumsy Royal Navy warships hardly capable of sailing to windward, with auxiliary steam power insufficient to make any progress in ice, for lack of power and sufficient coal to fuel the boilers, he would certainly have tried a wider channel to offer more sea-room. The full facts will never be known, of course, but I am sure that shore parties went out to King William Island while the ships were beset during the winter of 1846/7, to check out any channels to the east. I am equally sure that the report back would have been that such channels would not have been recommended, despite the lack of old ice, which is not usually found in those channels, because of the lack of sea-room to manoeuvre between the shoals, especially those of James Ross Strait. It was in James Ross Strait, I believe, that Amundsen had his problems, and he was in a tiny little vessel, of much less draft, and much more manoeuvrable when compared to “Erebus” and “Terror”. So this, I hope, should put an end to claims that Franklin could have sailed the route mapped by Rae. All the same, this route certainly could be and is a valid passage for modern vessels with shallower drafts, equipped with modern charts and electronic sounding devices. And, all the same, Dr. John Rae remains am extraordinary explorer, skilled surveyor, and resourceful hunter, who passed through lands where other white men died of starvation managing not only to keep himself and his party well-fed, but giving food to local Inuit along the way. So let us give him credit to him, alongside Sir John Franklin, not instead of him. The dominating figure among the seamen explorers of the first half of the nineteenth century is that of another good man, Sir John Franklin, whose fame rests not only on the extent of his discoveries, but on professional prestige and high personal character. This great navigator, who never returned home, served geography even in his death. The persistent efforts, extending over ten years, to ascertain his fate advanced greatly our knowledge of the polar regions. As gradually revealed to the world, their fate appeared the more tragic in this, that for the first two years the way of the Erebus and Terror expedition seemed to be the way to the desired and important success, while in truth it was the way of death, the end of the greatest drama, perhaps, played behind the curtain of Arctic mystery. One point of information which may be of interest, concerning the ships' draughts, Bourne (1852) gives the value for Erebus as 14 feet 1 inch (4.3m) and Crozier in his letter to Ross from the Whalefish Islands states "we have now a mean draft of 16 feet and all our provisions not yet on board", which equates to 4.9m. Peter, thanks for this. The 22 feet figure is from Wikipedia -- usually reliable in these areas, as only nautical buffs bother -- but I am not sure as to its source. They were very heavily laden at the Whalefish islands, and the draft presumably would have been slightly greater once all cargo was stowed. In Back's narrative of his earlier voyage with HMS Terror, he remarks at one point that "her draught of water, after the consumption of one year's food, was reduced by only one foot, being fourteen feet eight inches forward, and fourteen foot seven abaft. I think this vessel-specific figure is our best bet, and given that, during the navigational season of 1846 when whatever the ships managed was managed was also one year out, it answers perfectly. I have revised the main post to fourteen feet eight inches (4.47 m) for now. This still is, I believe, deep enough that both the James Ross Strait and Simpson Strait would have been extraordinarily perilous, and even the 5.5 m shoals in Rae Strait a "close call." And, more telling still, are Captain Toomey's points about sea-room; here one must consider the ship's squat beam of 27 feet compared to its length of 102 feet and relative lack of motive power relative to its weight (the ships "engines" were rated at 30 nhp, about the size of a large outboard motor today). So I still think it fairly clear that such vessels would find the islands, shoals, uncharted yet narrow navigational channels, and lack of room for maneuverability, impossible to safely navigate. As usual Russell, an excellent blog - most informative. Something to keep in mind: Though Franklin was an experienced Arctic explorer, he hadn't been involved with a SEA-GOING expedition since 1818, and thus would have relied heavily on Crozier and others, who had much more recent experience in ice navigation. Nicely done. But we do not yet see eye to eye. We agree, I think, that John Rae discovered Rae Strait. We agree that Victoria Channel, running to the west of King William Island, was perennially blocked by ice in the mid-19th century. We agree that Amundsen sailed through Rae Strait when he became the first to navigate the Northwest Passage. And that he did it in the Gjoa, which had a draft of just over 10 feet. You mention the size of the Terror. But what of Franklin’s lead vessel, Erebus, which had a draft of 13.8 feet? You allude to the “extensive shoal area in mid-channel (Rae Strait) of 5.5 to 18 metres.” But 5.5 metres equals 18 feet. That leaves plenty of clearance for Erebus. As Captain Thoomey states, even massive ships with drafts of 8 metres (26 feet) could “technically and theoretically” pass through Rae Strait and the adjoining channels. And the Hanseatic, which went aground in Simpson Strait, has a draft of 16 feet -- considerably more than 13.8. But my claim does not hinge on John Franklin and his ships. It is this: That John Rae discovered the only Northwest Passage navigable by ships of the mid-19th century. So, yes, as argued above, the Erebus could have made it. But also we have the Fox in which Leopold McClintock sailed in 1857. The Fox had a draft of 11.5 feet -- scarcely more than the Gjoa. 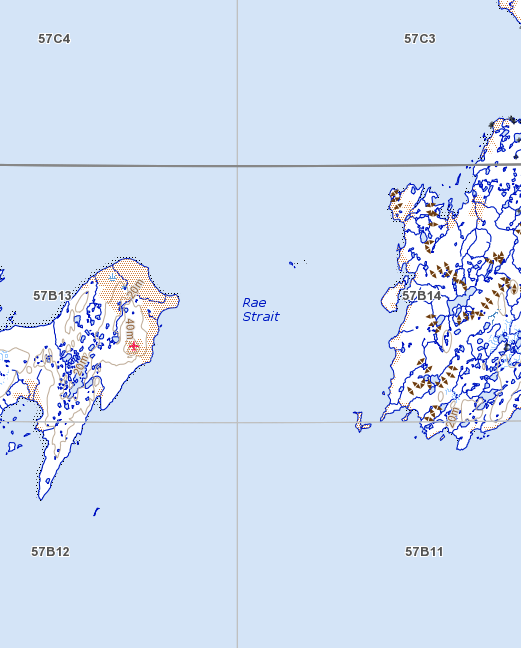 As you know, the reason Franklin turned west instead of east when he reached the tip of King William Island is that he had an Admiralty map indicating that the eastward channel ended in Poctes Bay. McClintock had learned from Rae that “Poctes Bay” was really a strait. Had McClintock not been thwarted at the eastern entrance to Bellot Strait, he would probably have completed the Passage in 1857-59. As for Joseph Conrad, well, I am a huge admirer of his work. But he died in 1924, and his assessment of Franklin strikes me as outdated, even quaint. He is right that Franklin is famous for his “professional prestige and high personal character.” But as I demonstrated in Lady Franklin’s Revenge, both of those were fabricated by Jane, Lady Franklin. Conrad is right that persistent efforts “to ascertain his fate advanced greatly our knowledge of the polar regions.” But again, those efforts came courtesy of Lady Franklin. I hope, Russell, that you will repent, and that you will accord John Rae the recognition he deserves as discoverer of the only Northwest Passage navigable to ships of the mid-19th century. But I will not hold my breath. Firstly: Yes, Franklin himself as commander would have made final decisions, yes, but the numerous smaller judgments of navigation day-to-day would doubtless have been made by the Ice Masters, with Crozier whose experience with both vessels was extensive and recent, taking a leading role. I think of Franklin more as the CEO of the undertaking -- the one large decision he'd have had to make himself was which way to go when he came to King William Land -- assuming of course that his vessels weren't inextricably caught in the ice prior to the point at which such a decision could have been made. There's no question that the route to the West would have been more appealing in terms of sea-room, but its being filled with heavy old ice certainly made it perilous. I agree with Captain Toomey that Franklin would almost certainly have ordered surveys of the vicinity, and therefore likely that he came to realize that there was a potential passage to the East. I am sure it may have seemed a godsend, but if his survey included depth soundings and rudimentary charting, I imagine he'd have realized it was far from ideal for his vessels; the hazards of James Ross Strait were among the first they'd have encountered. He might have chosen these risks as preferable to those of the Western route -- or, quite possibly, it was too late to extricate his ships from the heavy pack ice and make a different decision. The choice of navy surplus "bomb" vessels was made on the idea that strength and weight were assets in the uncertain combat with the ice. But such cumbersome vessels would have had a very difficult time with the Eastern route, even allowing a theoretical few feet of clearance from the shoals, and Simpson Strait -- which they would also have to pass -- would be almost impossible. So, for lighter ships -- a steam yacht like the "Fox" or a small sloop such as the "Gjøa" -- of course I agree the route surveyed by Rae was, with care, navigable by 19th century ships, while the route to the West was certainly not. But my point for Franklin's ships stands; for them, neither choice was likely to have been attended with success. Incidentally, the MS "Hanseatic" is stated in most sources I can find to have a draft of 4.8m, a little less than the 16 feet you mention; the Clipper Adventurer is 4.72m -- that doesn't seem to be enough of a difference to necessarily matter. What's significant to me is that Hanseatic could run aground in Simpson Strait, even with the marker beacons and being equipped with forward depth-sounding capabilities. And lastly, although there's no question that Lady Jane Franklin was a master manipulator and myth-maker and drove much of the Franklin search effort, there is ample testimony to his character from many men who served with, and under him; Lady Jane did not have to fabricate them. p.s. Ken, having just dropped by your blog posting on "Why John Rae and NOT Sir John Franklin", I'd just add that while we have address the Rae half of the equation -- I happily agree he discovered the only passage navigable by 19th-century vessels (provided they were a good deal smaller and more maneuverable than Franklin's) -- but then there is the more difficult part: Why *not* Sir John Franklin? I'll save that for another post coming soon! To that, I answer: Richard Collinson. Looks like I have more faith in certain officers of the Royal Navy than you. Put that expert navigator Collinson in the Erebus with a map by John Rae: voila, c'est fait. The Passage is accomplished. There's only one problem with your plan: Sir Richard Collinson was probably one of the worst commanders of men ever to sail north; on his voyage on HMS Enterprise he stirred up bitter resentment among all his senior officers, and one by one he had them arrested and relieved of their duties. William Barr has given a detailed account of his sorry command in his aptly-named book Arctic Hell-Ship. Just a few points here from the perspective of one who is also a ship's captain of 35 years experience, and a somewhat-familiar student of Franklin. 1. When taking a ship through a channel what is most important is not the knowledge THAT a navigable channel exists but knowledge of WHERE the channel is. We now know both - in 1846 neither was known. As Capt Thoomey eloquently states, the amount of room one has to maneuver to avoid hazards is also paramount. If you know, through a modern chart and navigation markers, where the channel is then of course you can safely take a ship of appropriate draft through in good conditions. Franklin didn't have these advantages. The abilities of modern well-found ships using still-imperfect but passable charts and navaids is frankly irrelevant to 1846-7. And 1m of clearance in a vessel drawing 4-5m would not be considered prudent even now in most circumstances, and would be quite unnerving in the often crystal-clear waters of the Arctic. 2. Nevertheless, there is testimony that hints that Franklin may indeed have tried "Poctes Bay" before backtracking and going to the west. A persistent story about a "wreck" at Matty Island and a nearby depot ashore may, as I have stated elsewhere (Unravelling pp 78-82), indicate that the ships may have tried to go east initially, only to run afoul of the shoals, and that one was lightened of stores (subsequently abandoned to be found by the Inuit), and refloated. The abandonment of the stores could be explained by the loss of one of the ship's boats used in ferrying stores ashore (or perhaps back) and could form the genesis of the "wreck" in this anomalous place. 3. As Russell points out there may have been no "choice" involved for Franklin's ships, and Franklin therefore deserves no "blame" for blundering into Victoria Strait. They could have been caught in the ice-stream to the north of Cape Felix and forced to the west - we simply don't know. What we do know is that it was the universal preoccupation of every other Commander of an arctic expedition to find shelter as winter approached rather than be caught out in the stream. The one time this proved impossible - Back's abortive and disastrous 1836 Terror expedition - still provides graphic reading, which Franklin would have well known, and to which the still-scarred Terror could attest. Since J.C. Ross had said that there was an "excellent harbour" near Tennant Island, even if Franklin had thought incorrectly that "Poctes Bay" was closed off to the south he might have headed for that if possible. I would have. 4. Although it is difficult to reconstruct Franklin's character from the stilted writing of his official narratives, (in common with the type) a reading of his letters and those of his messmates and acquaintances reveals that he was almost universally respected and admired by those who knew him. He had two devoted wives, his courtesy and kindness to others are well-attested, and his longest seagoing command on HMS Rainbow was known as an exceptionally happy ship ("the Celestial Rainbow and Franklin’s Paradise"). Letters from Whalefish Islands from Fitzjames, Fairholme, Irving etc. all reinforce this view of the man. Rae remains a personal hero (though not without his own faults), and Lady Franklin I find more admirable than agreeable, but there is no point in us trying to sell caricatures of people 160 years later in the face of the opinions of their contemporaries. Dave, thanks so much for your note here ... it's very good to have your thoughts on this, as so much of what we know, and are seeking to know yet, is based upon your books and searches. I hadn't recalled about Ross;'s reference to an excellent harbor near Tennant Island; that would indeed have sounded promising.